This is a lightning talk of ongoing research, given at the 2018 American Historical Association meeting on January 4, 2018. I’ve revised the text of the talk to provide more details about this project below. Initially, this talk was entitled, “Text Mining 18th Century American Correspondence,” but I began my research by using topic modeling to highlight documents that may be most helpful. I am particularly interested in looking at matters of land, territory, and property in the correspondence records to understand why settlers moved into the Northwest Territory (or the modern Midwest) and how American political leaders viewed these lands. This is part of a larger project that interrogates the origins of American settler colonialism as practiced by the United States in comparison with the formation of the French settler colony in Algeria. A 1776 petition from settlers in the modern state of Kentucky to the Virginia Assembly planted the seed of an idea for this project. In this missive, the settlers begged for assistance to fend off avaricious land speculators and raiding Native warriors. The petitioners positioned themselves as men and women who had moved across the mountains “in order to provide a subsistence for themselves and their posterity.” This sentiment was repeated in numerous settler letters – both official and private. Americans and newly arrived immigrants flooded into the backcountry to achieve a “competence,” which required independently owned land that would provide a comfortable living for their families and future generations. To investigate the notion of competency as a motivational factor for the emigration of Euro-American settlers to the “Northwest Territory,” what is now the American Midwest, I decided to topic model the correspondence of members of the Continental Congress and petitions from settlers in the Northwest Territory. Topic modeling is a text analysis approach that utilizes an unsupervised machine learning algorithm (there are several options, including LDA) to identify underlying “topics” that organize a group of documents. My own application of topic modeling does, indeed, use LDA, or the Latent Dirichlet Algorithm, with MALLET, an open-source package from the University of Massachusetts, Amherst. For a tutorial on MALLET, check out the lesson in Programming Historian. This corpus consists of hundreds of letters from members of the Continental Congress between 1774 and 1787. *Note: This corpus, comprising 25 settler petitions to the Continental Congress and the United States Congress between 1781 and 1797, is much smaller than the recommended size of hundreds, if not thousands, of documents, to achieve the best topic model. As the spreadsheet above shows, documents 2, 25, 10, and 1 are most representative of the topic of interest, topic 4. Reviewing these documents, I highlighted the words from topic 4 in which I was most interested: industry, welfare, pleased, rights, duty, husbandry, and settled. In a close reading of these documents, with the addition of document #3, which I identified as related through my familiarity with the sources, I found that settlers’ desire to achieve a “competency,” or the means to provide for their families on independently owned land, motivated the decision of at least the petitioners to make a life in the western territories. They sought governmental assistance to access these lands at reasonable prices and the recognition and validation of pre-existing claims. In order to determine how representative these letters are, I will need to compare the text of these petitions to a larger corpus of settler correspondence and to compare the list of signatories with the list of all settlers who appear in correspondence records. I then became interested in how the settlers, themselves, defined competency. These documents show that petitioners also described competency as the ability to “rear children in a comfortable manner” and “raise a subsistence by their [own] industry.” In order to achieve these aims, they begged Congress for reasonable land prices. Their petitions also expressed an underlying notion of a “right” to the western lands, which they believed they had earned through the sacrifice of leaving loved ones to immigrate west, their labor, and the improvements that they had made (or planned to make) to the land. (St. Clair to Washington, Aug. 1789, Territorial Papers of the United States, v. 2). Whereas, settlers were most interested in the opportunities for personal independence, upward social mobility, and an endowment for their children that access to western land provided, the correspondence of members of the Continental Congress focused on its financial benefits. Political leaders were most interested in selling the lands that Native communities ceded to pay off the national debt. If we consider the underlying definition of competency as providing an independent, comfortable living, without burdensome debt that returns one to a position of dependency, then this is precisely what both the settlers and the American political leaders were attempting to achieve, albeit through different means. However, the government could not achieve its goals without people to buy the land, therefore, the desires of both the settlers and political leaders proved mutually reinforcing. Notice in particular, the following words from these topics: transmitted, negotiations, ceding, extinguishment, extinguishing, and, ominously, funeral. Most of these words are more or less neutral, but they elide the brutal effects of American land acquisition and expropriation from Native communities. This project is only a first step in analyzing these, and other, correspondence records from the late 18th century to understand this region’s development within the framework of settler colonization and the impulses that brought the Northwest Territory into the United States. Use techniques, such as part-of-speech tagging and collocation analyses to study each populations’ understanding of the Northwest Territory, motivations, and objectives. “Petition from the Inhabitants of Kentucky, 15 June 1776,” in George Rogers Clark Papers, Illinois Historical Collections 8: 11-12. For an introduction to analyzing topic models, see Miriam Posner’s blog post. 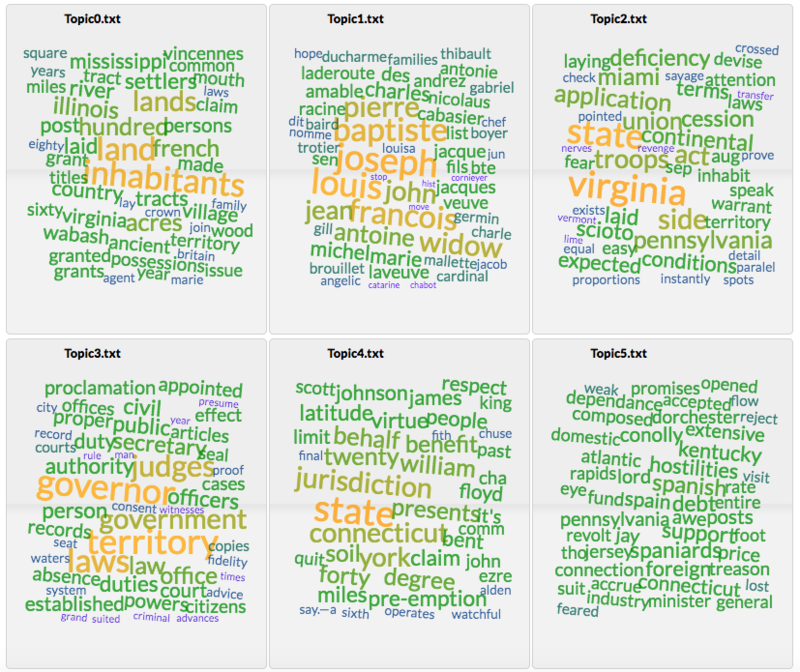 For those familiar with, or willing to learn, R, see how to run MALLET from within R and view the results with Graham, Milligan & Weingart’s “Topic Modeling with R,” in The Historian’s Macroscope.